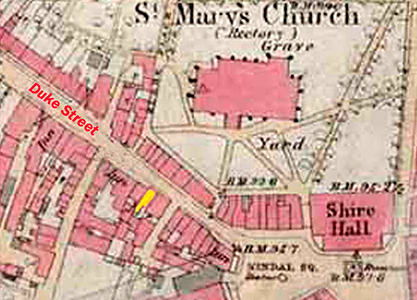 Henry Digby is first recorded at this address on the 1871 census. The family remained here until shortly after 1902. The two photos above show the section of Duke Street between Tindal Square and The Golden Fleece Public House. The left hand photo dates from 1880's and shows the original Golden Fleece at 84 Duke Street. Using the 1902 street Directory (below right) you can identify the various properties with their occupants. 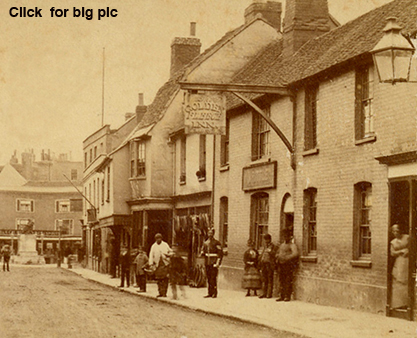 On the extreme right of the photo is probably Eliza Bull standing in the doorway of her shop at No .82. 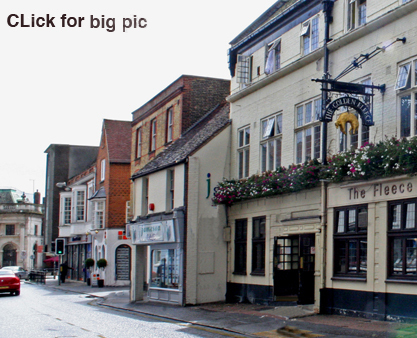 Working to the left we next have the Golden Fleece Inn which occupies two original properties at 83 and 84. Next door at 85 is the only building which has survived to the present day. It was then a saddle and harness makers shop. Henry Digby's Fishmongers shop was next and can be seen as the first property pertruding on to the pavement. Beyond this shop is a butchers, florists, and tobacconist who also manufactured cricket bats. The top righthand photo shows this part of Duke Street present day. As mentioned above, the only building surviving is the shop at 85 which is now an estate agents. To its right the Golden Fleece has completely rebuilt with an extra floor and has been extended to include the property at 82 which in later years became a branch of Macfisheries. Henry Digby's family business was taken over by his sons John and William following Henry's death age 65 in 1897. 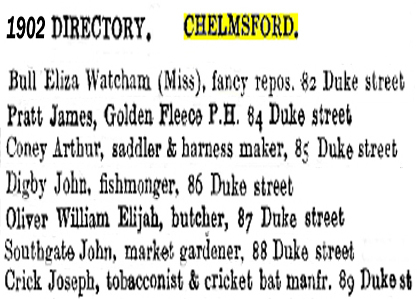 Shortly after 1902 Chelmsford Council drafted a proposal to widen Duke Street. This would entail demolishing all properties from Digby's shop to Tindall Square. All the owners of these properties were financialy compensated, and in John Digby's case he soon moved to London to start a new career.